What is is Seating, Positioning, & Mobility Assistive Technology? Examples of mobility devices include canes, walkers, crutches, orthotics & prosthetics, wheelchairs, scooters and power chairs. Seating and positioning devices are used for reasons such as improving postural control & deformity management, pressure & postural management, and/or comfort & postural accommodation. When and where do I need to use them? Seating, Positioning, and Mobility devices may be needed at any time and in any place. Who needs Seating, Positioning, and Mobility AT? Seating, Positioning, and Mobility AT is important for people with disabilities who need assistance to achieve and/or maintain a position that enables them to participate in daily activities. It is important for anyone that has difficulty maintaining a functional seating position that allows purposeful movement It is important for anyone who has difficulty moving from one area to another area. Why is Seating, Positioning, and Mobility AT important? By providing a functional seating position, AT can reduce or eliminate the need for human assistance for daily activities. It can reduce fatigue thereby allowing the person to participate for longer periods of time and save energy for other tasks. Devices that aid in mobility allow a person to transition from one place to another to participate in daily activities. Someone with limited mobility may not even be able to leave his bed in the mornings without a device for support and safety. Below, you'll find videos explaining assistive technology directly related to Seating, Positioning & Mobility. You can click the first graphic to play all three consecutively OR... click one of the three to play it individually. Here's INDATA's YouTube video playlist for Mobility. The need for seating, positioning, and mobility devices is often medical in nature and often must be customized to a patient. Therefore the need for these devices is typically addressed using a medical model, rather than the education model, through the person’s physician, private therapists, and insurance/Medicaid. However, there are instances at school when seating and positioning devices can assist in postural support, pressure management, positioning of other devices, and even attention to task! Assistive technology is available in all of these situations. Ensure desk chair is appropriate height that feet can rest flat on the floor with hips back in the chair and hips and knees flexed at a 90 degree angle. Provide an angled surface for writing. A 4” binder turned sideways works well as a low-tech solution. Consider seat location with the room. Ensure clear pathways to commonly used areas of the room. Consider the direction of the seat so that student can see the board and other important areas without needing to turn in seat. Preschool student with developmental delays. Children with developmental delays often have difficulty with classroom structure and attention to task. A preschool student with developmental delays may have difficulty staying seated in one place and focusing on teacher/activity during group learning times on the floor. Possible Recommendations: Some children will respond well to a visual boundary for their space on the floor by making a square with masking tape or painting tape that won’t damage the carpet. Others may need a fidget item or a weighted lap pad or other object. Still others may require some additional proprioceptive and/or vestibular input such as a Disc-O-Sit, ball chair, or HowdaHug seat. Trying sever al options to determine which concept is most helpful is important. Elementary-age child with cerebral palsy. This student has high muscle tone due to cerebral palsy. She has difficulty accessing school materials and devices due to difficulty reaching. Her spasticity, which increases when her positioning is poor, also requires that anything she is reaching for be stable so that it does not get knocked off of the table or other surface accidentally. Possible Recommendations: She needs prope r positioning for her body as well as positioning devices for school tools such as iPad/tablet and computer. Using positioning wedges to keep her hips, knees, and ankles at less than 90 degrees will help manage her high muscle tone. A wheelchair that tilts can also be helpful. 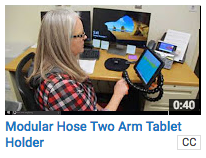 To position a device within her reach and be stable the school could use a Modular hose tablet holder or a Mount-N-Mover. terinarian but knows he won’t be accepted to vet school if his grades don’t improve. Possible Recommendations: Students with difficulty focusing can benefit from a seating and positioning strategy that encourages alertness. 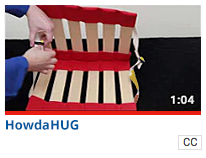 Adding a Disc-0-Sit to his chair may help. Or he may need a completely different type of chair such as a Zuma Rocking Chair, Wobble Chair, T-Stool, or a Sit-N-Gym ball. Or he may be more alert if he is standing at a standing desk. For students transitioning into the community or employment settings upon high school graduation - To ensure successful AT transitions for students aging out of school services, it is important for any AT the student is currently using or may need to pursue employment outcomes, whether written into the child's Individualized Education Program (IEP) or not, be incorporated into the student's Individualized Plan for Employment (IPE). IPEs are developed through collaboration with the state vocational rehabilitation agency using a Vocational Rehabilitation (VR) Counselor. Some people with disabilities need assistance to achieve and/or maintain a position that enables them to participate in daily activities. They may have difficulty maintaining a functional seating position that allows purposeful movement without undue fatigue. They may have difficulty moving between areas to change tasks/activities. Because these challenges typically occur across all areas of an individual’s life, they are often addressed, on some level, through the person’s physician, private therapists, and insurance/Medicaid. However, the need for assistive technology and modifications to the work environment must be considered for each person with a disability despite the equipment they may or may not already have. Providing postural support/control can reduce fatigue and increase ability to work efficiently and effectively for longer periods of time. Reducing risk of pressure sores which poses subsequent health risks and time off work. Increasing comfort results in improved function Providing for mobility within the work places reduces the need to rearrange the work environment, increases self-efficacy and mood by allowing for changes, and improves employee comradery by allowing for interactions throughout the workplace. Some people will need modifications to their work environment despite the availability and use of assistive technology. These modifications may include structural changes to doorways and the approach to the building as well as restrooms and breakrooms. Modifications may also include changes to the layout of the area such as locations of desks, file cabinets, telephones, etc., to modify the workflow. Person with paraplegia applying to work as bank teller. A person with a spinal cord injury resulting in paraplegia is applying to work as a bank teller. The person uses a manual chair for mobility. The chair meets her seating and positioning needs for 1-2 hours at a time. For longer periods of seating she needs alternative seating. Because the bank is a public building all entrances and routes for the public should already be wheelchair accessible. The bank may need to consider routes into offices where the interview will take place. Doorways should already be wheelchair accessible but furniture placement should be considered to ensure routes are easily accessible to a wheelchair user. The interview is expected to last no longer than 1 hour therefore she will be able to remain in her wheelchair and not need alternative seating. Due to ADA accessibility laws the bank is accessible and no specific AT or other accommodations are needed for a successful interview. Person with spinal cord injury hired to work as bank teller. A person with a spinal cord injury has been hired to work as a bank teller. She has paraplegia and uses a wheelchair for mobility. She is unable to sit comfortably in her wheelchair for longer than 1-2 hours. The bank already has two teller windows that are table height (as opposed to standing height) to accommodate patrons with disabilities so there are two possible workstations for the employee to use that do not require accommodations for her need to sit. She will need alternative seating such as an ergonomic chair that is also height adjustable to fit her at the appropriate height for the teller window. Depending on the height of the teller window she may also need a foot rest. She will require frequent short breaks to allow for position changes due to the possibility of skin breakdown when seated in one position for extended periods. She will need access to all needed equipment at her teller station. Please see the Computer Access Page for Employment for specific AT ideas for computer access if that is a need. With appropriate alternative seating (chair and footrest), frequent short breaks, and the availability of all supplies and equipment at her teller station, the employee will be able to perform the functions of a teller independently. Person with spina bifida hired to work as stocker in grocery store. A person with spina bifida has been hired to work as a stocker at a grocery store. He uses crutches for mobility. Empty boxes will need to be returned to the storeroom by another employee. The employee will only be required to stock shelves at the level of his head and below, while seated. Certain items might be able to be stocked at a higher level with the assistance of a reacher. A communication system for a support person to help with the first two tasks will need to be in place (i.e. pager, 2-way radio). The employee will need a stool or chair on wheels to be able to easily maneuver in the aisles while stocking. The chosen item should provide the level of support needed for that particular individual. His crutches can be supported on the cart for transporting boxes. This employee is able to perform the task of stocking shelves with modifications s to the job task and a rolling stool or chair to accommodate his mobility needs.